Kinesio Tape and Running: Answers to some of your common questions | Run S.M.A.R.T. It’s impossible to miss the vibrant colors of Kinesio Tape that plastered athletes in the 2008 and 2012 Olympic Games. 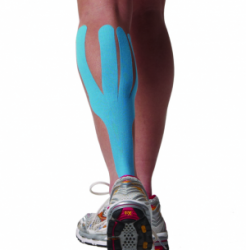 Kinesio Tape, invented more that 30 years ago, has since taken the sports world by storm. So next time you line up at a race next to someone wearing it, you will know what it’s all about. Kinesio Tape was developed to help injured muscles recover faster and work less during exertion. Depending on the direction and amount of tension, certain taping techniques can increase circulation, support muscle function or “strap” and secure misaligned joint mechanics. Between the circulatory system, muscles, deep fascia, and skin, all these structures are sandwiched on top of each other and by applying a force to one, will ultimately influence those layers below it. There are several companies that now manufacture the tape in various colors and designs. I prefer the Kinesio Tape brand and in my experience, red, blue and tan tape all work the same; however I’ve found that the black tape lasts longer during races and endurance type activities. Does it really work and if so, where can I get it? Many of the athletes that use Kinesio Tape swear by it although there is little professional research proving the effectiveness of the tape. Some believe it to be a placebo effect, while others truly believe it works. Although many brands have moved towards developing more products for the general public, it was originally designed to be used by healthcare providers. People can be taught to tape for certain injuries, but if the taping is not done correctly or if it begins to peel off, then it becomes useless. You should always look for the CKTP (Certified Kinesio Taping Practitioner) designation. These sports medicine clinicians have spent numerous hours learning the proper taping techniques and have successfully passed a board exam. Chris Lauretani, PT, MS, CSCS, CKTP is the founder of Symmetry Physical Therapy in Westchester County, New York. As a New York and Connecticut licensed Physical Therapist, Certified Strength & Conditioning Specialist and Certified Kinesio Taping Practitioner, he serves as a sports medicine consultant to numerous professional organizations and running clubs.